Words Out Loud returns to Babushka lounge in Ballarat on Thursday, April 20, 7-9pm, for its next session of spoken word. Writers, readers, poets – all word lovin’ folks with a hankering to share the love are invited along, with five-minute open mic spots on offer. Babushka has excellent sound and backing tracks can be accommodated. You won’t find a friendlier venue. The event has a nominal theme of “the going down of the sun”, but as always, performers are encouraged to take the theme and run with it for their 5-minute slots – or ignore it altogether! Words Out Loud – blood, sweat and ink! Words Out Loud returns to Babushka lounge in Ballarat on Thursday, March 16, 7-9pm, for its next session of spoken word. The event has a nominal theme of “blood, sweat and ink”, but as always, performers are encouraged to take the theme and run with it for their 5-minute slots – or ignore it altogether! Words Out Loud returns to Babushka lounge in Ballarat on Thursday, February 16, 7-9pm, for its next session of spoken word. The event has a nominal theme of “the heat is on”, but as always, performers are encouraged to take the theme and run with it for their 5-minute slots – or ignore it altogether! Entry is free, though a gold coin donation would be appreciated for this non-profit, community event. A special raffle at February’s event will aid Babushka’s crowdfunding campaign to help this convivial and supportive venue keep grooving. 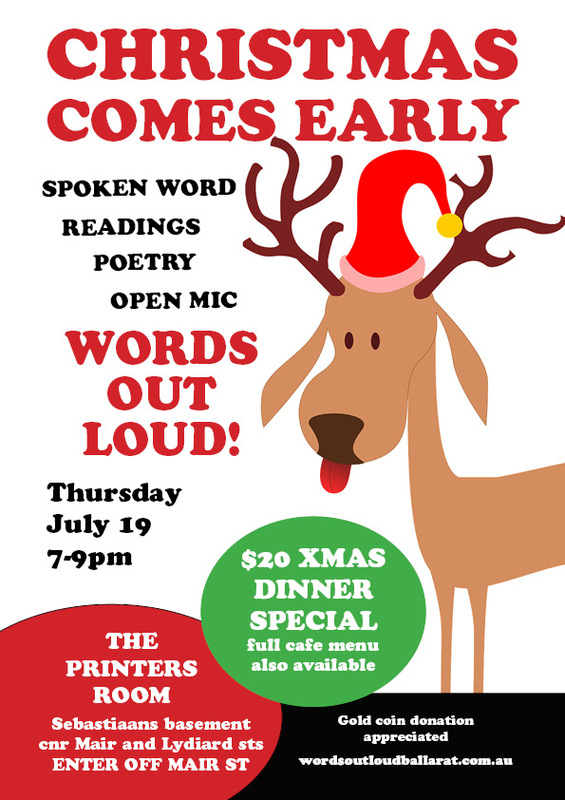 Words Out Loud returns to Babushka lounge in Ballarat on Thursday, January 19, 7-9pm, for its next session of spoken word. The event has a nominal theme of “fresh start”, but as always, performers are encouraged to take the theme and run with it for their 5-minute slots — or ignore it altogether! Words Out Loud returns to Babushka lounge in Ballarat on Thursday, October 20, 7-9pm, for its next session of spoken word.